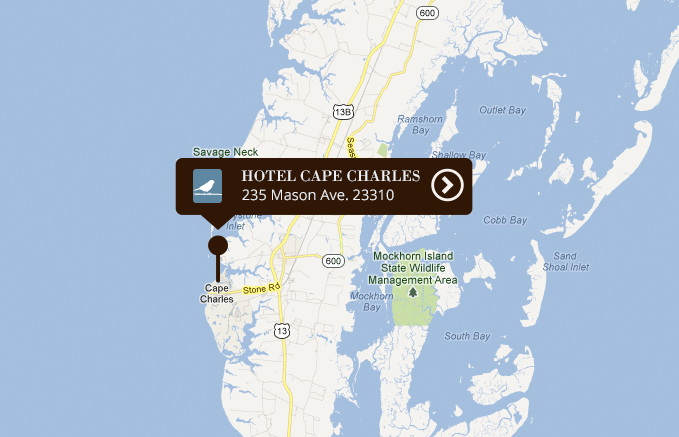 Cape Charles has become a hub for tourism on Virginia’s Eastern Shore. This small sliver of coastal Virginia contains a unique combination of refined amenities in close proximity to some of North America’s most beautiful natural habitats. The Town of Cape Charles, small town America itself, boasts a public beach perfect for families, an ice cream store on the corner, and a hardware store from a bygone era. Opportunities for recreation and relaxation abound on the Eastern Shore, the only limitation being the time you have to stay with us. We hope you will take some time to discover some of these hidden treasures. The nation’s largest estuary, the Chesapeake Bay offers many peaceful distractions, from relaxing on the Cape Charles beach, to sailing, fishing, kayaking, kite-boarding, birding, and beach-combing. In Cape Charles, we enjoy a California sunset everyday! From gourmet fare to beach blanket clambake, Cape Charles has a place for every taste—and perhaps the finest hand-crafted ice cream you will ever taste. For wine lovers, our vineyards produce award-winning vintages each year, not to be missed. On the Kayak Winery Tour, paddle right up to Chatham Vineyards, a waterside vineyard, for a wine tasting. Or enjoy wood fired artisan pizza with a glass of wine at Bloxom Winery. If a little exercise is on the agenda, get outdoors! Woven though the lower Eastern Shore are trails for walking, running, biking, and horseback riding. If you would like something a bit more tame, the Hotel has 6 beach cruiser bicycles for rent to guests, and the area is lucky to have stables where excursions by horseback can be arranged. The pride of coastal Virginia, the twin courses at Bay Creek—designed by Jack Nicklaus and Arnold Palmer—are as renown for their challenging layouts as for their stunning landscaping. Our staff will be happy to set up a tee-time and luncheon for your group with our friends at Bay Creek. Based in Cape Charles, you’ll find world-renown wildlife refuges and parks at the doorstep, all less than 10 minutes away. Each season has a special character, but for birders, the autumn migration is unrivaled on the Eastern Shore. The southern tip of the Delmarva Peninsula is an important migratory bird stopover location along the Atlantic coast. This narrowing peninsula created by the Chesapeake Bay and the Atlantic Ocean causes a funneling effect on the birds as they fly southward. Our current bird list of 409 species, found in and around the Eastern Shore of Virginia National Wildlife Refuge is a great resource for planning your bird watching visit. Cape Charles is home to an eclectic group of shops and artisans.These artists and artisans produce an amazing array of wood works, jewelry, paintings, photography, pottery, fabrics, and sculpture. After an arduous day of shopping, rejuvenate at Breezes Day Spa, just around the corner from the Hotel. What better way to see the area than from the air? Hang glide high above the Chesapeake Bay and Atlantic Ocean, and see Virginia’s wild barrier islands from a mile up. The silence and vast beauty will transform the way you see the world. 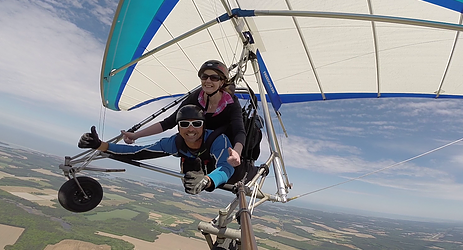 You don’t have to have any experience—the certified instructors at Virginia Hang Gliding will teach you all you need to know. For local exploring, golf cart rentals are the “transportation of choice” for many visitors and local residents. To reserve yours, contact Eastern Shore Custom Carts. Each summer, Cape Charles is transformed into the center of a progressive arts scene. Experimental Film Virginia gathers artists from all over the world to convene on the shores of the Chesapeake Bay with a mission to create new short films inspired by the people and places of historic, small-town and rural America. The group of 40-50 artists gathers for an intensive two-week process. Experimental Film Virginia bridges the space of performance between stage, screen, and site, offering art-soaked weekends to attract friends from near and far to the Eastern Shore for live events.